6th Anniversary of Hitler's Power! To celebrate the occasion of his 6th anniversary as the leader of Germany, Adolf Hitler made a public speech in front of the Reichstag. He openly accused Jews and adamantly threatened to annihilate them.The above text was his speech. The St. Louis Turned Away! 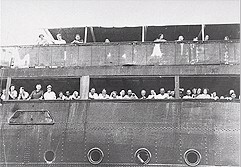 The St. Louis was a ship transporting 930 Jewish refugees from Nazi Germany to Cuba. On May 13, 1939, it set sail, and all of its passengers had legitimate landing passes in Cuba. But a majority of the unlucky people were turned away by Cuba's pro-fascist government. Only 22 were admitted. The St. Louis was not accepted by the United States either, and was forced to return to Europe. 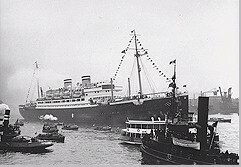 The refugees were taken in by Great Britain, Belgium, France and the Netherlands. Only those who were admitted by Great Britain lived to survive.